Every now and then a band comes along that claims Middle Eastern influences. Sometimes it's drenched in it, lyrically and musically -- Orphaned Land and Melechesh, and to some extent Nile, come to mind. Other times the band really just means the drumming, even if their logo is made to look like it's written in Arabic. 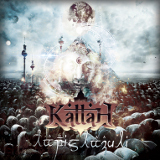 Brazilian prog-power outfit Kattah is more of the latter type, a band billed as Middle-Eastern-influenced, but whose influences mostly come from power metal acts from Europe and their home country, with a big dollop of Iron Maiden influence and with the Arabic parts veneer on top. Not that it's a bad thing. The album is mixed, very mixed, but nonetheless quite a bit of fun to listen to. Behind the Clay, for example, does indeed have some Arabian-style drumming -- but that is subsumed beneath the high but full vocals of Roni Sauaf (who sounds like Pagan's Mind's Nils K. Rue or a late-career Bruce Dickinson), and the often annoying prog-rock practice of sticking half-whispered vocal samples partway through a song. Sauaf's vocals do the job of soaring over guitarist Victor Brochard's leads nicely on Inside My Head, and those guitar leads drive most of the songs; his melodies and soloing on Apocalypse bring in an atmosphere that one could call Middle Eastern, though the chorus sounds a bit tired and Sauaf sounds slightly off-key in places. Alpha Centaury, on the other hand, consists of a driving, NWOBHM-style beat that is punctuated by a slow, langourous chorus that doesn't prevent it from picking back up where it left off as soon as the song reaches a verse; it flips back and forth between quiet introspection and a storm of guitar soloing that is heavy on the wah-wah pedal, and was one of my favorites on the album. Vetus Espiritus, despite a rather generous helping of prog pretentiousness, has a prettier chorus than most of the songs and couples that with some beautiful soloing -- but of what? It sounds like a synthesizer, but feels to me like the guitar, which makes it all the more charming. Rebirth of Pharoahs, too, is excellent and diverse. In keeping with its name, it also contains some Arabic melodies, but has a better chorus than Apocalypse. Those choruses, however, are an Achilles heel for the band. Why do almost all the songs, no matter what their verse's beat or how many guitar pyrotechnics are inserted in the middle, have that same mid-tempo chorus, right down to the same chords being used? There is no good answer to that. The title track does this too, though rather than sticking to a formula it breaks off into some serious weirdness a couple of minutes in. Everything stops to let a group of kids sing a nursery song or a lullaby partway through, Sauaf joins in a capella, and then this is followed for a short time by acoustic guitar playing another Middle Eastern melody, though it's generic enough to just be labelled "world music"; A Capoeira follows with more, but one that honestly mixes metal in to a point that I could say they are truly attempting fusion here rather than just gluing Arabic music onto power metal. Land of God is a quiet piece that was much-needed after all the power metal beats, and even though Bruce Dickenson wrote, autographed, and closed the book on this kind of piece on his solo albums, its key change on the final round of choruses and dramatic guitar soloing are still attractive to the ears. You Will Never Be Dead keeps the NWOBHM vibe initially, but moves to a more epic, modern power metal where the guitar is dominant and the drumming double-times to the chorus; this one is the longest and except for the start of the song, this is the part of the album I most wanted to listen to again a few times. And that sounds like it ought to be the end, that the rest of the album has to be an anticlimax, but after a short instrumental, we get Last Chance, a fine song in its own right that doesn't fit in at all with the rest of the album. With a backing organ, feel-good lyrics and the guitar eschewing its usual soloing for the most part in favor of blocky, well-placed power chords, the sound is that of the late 70s; if Sauaf's vocals were more like Ian Gillian's, one might imagine for a moment or two that one is listening to Deep Purple, or one of their followers. It's hard to determine what to make of Lapis Lazuli. Despite their interest in Middle Eastern music, the album never truly manages to integrate that into their sound, and the band has so many half-formed ideas that they put into the tracks, often to the detriment of the songwriting, that none of them come to full fruition. That, however, is offset by the value of some of those ideas. Last Chance and some of the more prog-oriented tracks indicate promise outside of the fairly narrow range Kattah is mostly staying within with its combination of NWOBHM and Arabian music, and those who don't mind some of the weaknesses of the songs mentioned here will likely enjoy the album.